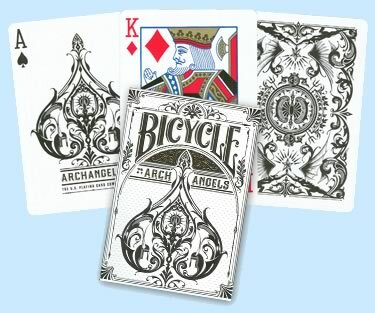 These Bicycle Archangels Playing Cards feature a unique back design with special card faces. In addition, the ornate white tuck boxes feature hot stamped gold foil imprints as well as a dimpled surface. Bicycle Archangels Playing Cards are poker size with regular index faces. One double back card is included in each deck. The decks are the same quality as regular Bicycle Playing Cards.